Her answer to everything is "no me" meaning not me. Every morning she "crawls" daddy to the door, pulls herself up at the gate, and yells "buh bye dada, buh by," slightly crying while she says it, because she is upset he is leaving, but she knows the routine, and how it has to happen. It melts my heart every time. She knows where her head, nose, mouth, ears, teeth, feet and belly are exactly on her body. She likes to brush her own teeth. She likes to take baths with mommy. She loves the doggies. She calls Cloe, Clo Clo, like I do, and she pets them and says "nice." Sometimes, when I catch her in a good mood, I'll start taking pictures of her and she will say "chesse" and give me that cheeser smile that I've always loved. She can finally walk holding onto things now! Her favorite thing in the world, besides bunny and bucky (this is what she calls her pacifier...), is Minnie Mouse! She LOVES babies, like literally OBSESSED! When we see a baby in public, she gets mesmerized! She says "hi baby" over and over, and just stares! 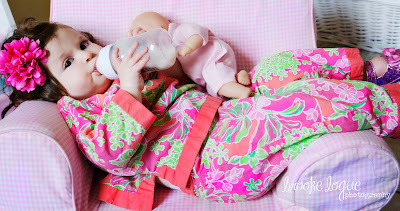 She also loves her baby dolls. This reminds me of myself as a child. Her hair is curlier than I ever imagined! She is a cookie monster. Everything that is flat and round, and comes out of a box is a "cookie." When I tell her it's night night time, she crawls as quick as she can across the house, as if she was running away from me, laughing and squealing. She thinks it's a game. Every single night! Such a cutie pie. She eats oatmeal with her hands. She's SUCH a Daddy's girl, and let me tell you, Daddy is such a Maren's girl. She HATES having her diaper changed! She blows me kisses from across the room. She hears Mickey Mouse Clubhouse on TV from the other room, gets so ecstatic, and crawls real fast to the other room, pulls herself up on the TV stand, says "hi" to mickey, and blows kisses. Ridiculously cute. She still only has two teeth! When shes feeling super sweet, she cuddles against me and pats my back and says "ahh baby."